"In 1932 amazing Egyptian archaeologist Selim Hassan discovered this Pyramid on the royal path of Mykherinos. Later on, much controversy arose: some said it was not a Pyramid, but a tomb, where was buried the daughter of Mykherinos: Queen Khentkawes ("In-Front-of-Her-Kas"), belonging to the 4th Dynasty. Selim Hassan indeed found a pink granit door bearing the Queen's titles, but neither mummy nor sarcophagus was found. Make no mistake: this Pyramid is built out of a huge cube of bedrock carved in fine Turah limestone, with a masonry structure added on top. 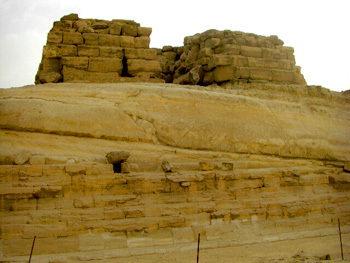 As far as I am concerned, it is a very old Pyramid that was used later on as a mastaba (by adding some elements to it). It was usual to usurp ancient monuments, under all dynasties. 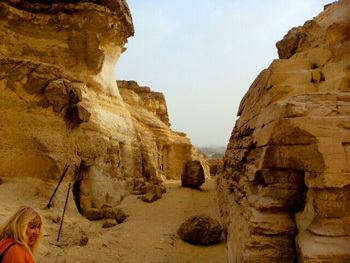 Furthermore, it is interesting to note that a recent geomorphological study carried out by French researchers seems to show that any structure built on a substrata, a rocky outcrop, a hill, would always be, in Egypt, an actual Pyramid (contrary to the tombs). Now, the percentage of substrata in Khentkawes (64%) really proves that is is a Pyramid in its own right (just like Kheops, Khephren, Abu Rawash etc). Once more it is not recognized that a real Pyramid is at first never meant to be a tomb, and that in time it became possible to use the remains of its structure to include a tomb, or something else. Moreover, this Pyramid's Valley Temple, and even its boat pit, are on the south flank, as it should be. It is indeed an authentic Pyramid close to the sphinx, which, when you come to think about it, changes the whole plateau's configuration." It's easy to see all the added structures on this Pyramid's rock, certainly truncated in the course of time.